Director Karyn Kusama reunites with The Invitation screenwriters Phil Hay and Matt Manfredi for this gritty LA cop thriller dominated by a career best performance from Nicole Kidman. Kidman is Erin Bell, a damaged and haunted LA cop who hasn't been the same since an undercover operation involving a gang of bank robbers went wrong 16 years earlier. Now she believes that the gang's sadistic leader Silas is back and looking for revenge and she is determined to track him down. 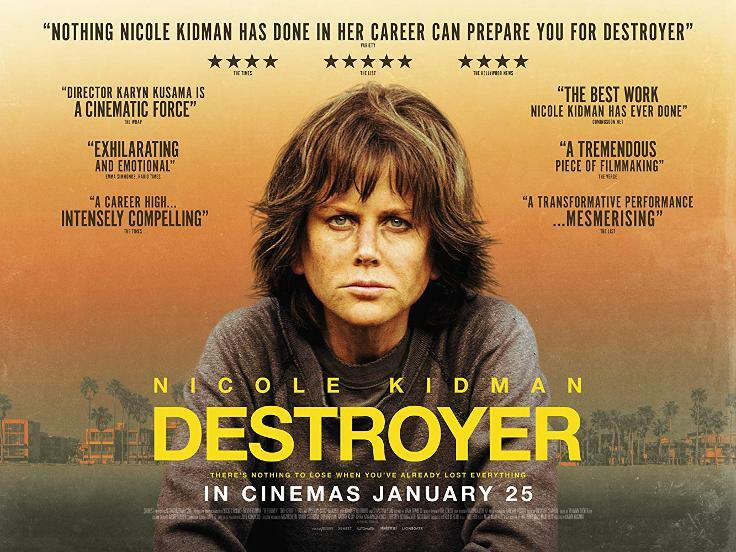 Perhaps slow and measured in the way it gives up its secrets, with the exact details of the botched bank job 16 years earlier held back until the end, Destroyer is never less than compelling however in the way it tells its story. Much of this is down to Kidman's performance, who commands the screen throughout. Though she dominates, she is backed by a fantastic supporting cast including Toby Kebbell as Silas, Sebastian Stan as the FBI agent she goes undercover, and subsequently falls in love, with, Tatiana Maslany as a fellow gang member, Scoot McNairy as Bell's ex-husband and Bradley Whitford as a smug sleazy lawyer. There are also notable roles for Toby Huss and Beau Knapp. Brilliant tense direction from Kusama, especially in the aforementioned botched bank job, ensure this is more than just the Nicole Kidman show. While the different eras and flashbacks are impressively put together by the wonderfully named editor and longtime Kusama collaborator, Plummy Tucker. It's not without its LA cop genre clichés and the fact that it's more interested in creating a compelling character study than delivering frequent thrills may put off some but this is a superior thriller and well worth catching.